Stacy Adams Madison boots have been around since Putting on the Ritz was a current term. We are talking the days of Prohibition. The roaring twenties. The Madison boot has long been prized for both being stylish as well as very comfortable to wear because men don't just want their shoes and boots to look good, they need to be comfortable as well. These are the new anaconda print leather Stacy Adams Madison boot featuring an real update in style for a whole new generation who need to know what dressing stylish the old school way is all about. Featuring rich gray color leather with an anaconda snake print that is sure to get looks quick. 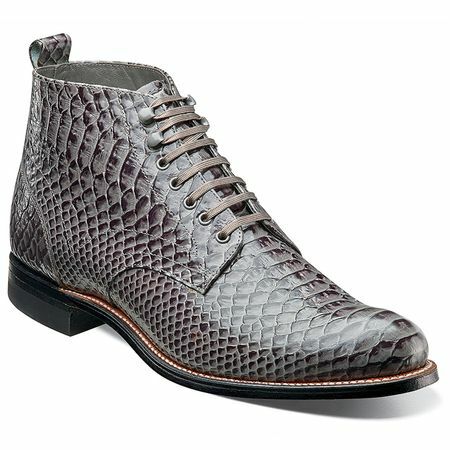 You can wear these gray anaconda Madison boots with anything you would already wear your Stacy Adams shoes with as well as dress them down and wear them with jeans and a blazer.